I love Sundays. We wake up, get the coffee going, get the shower started and get ready for church. We all head out to church separately because we all have to be there at different times. We worship with fellow believers and before we know it, it’s over and it’s time to figure out lunch. Today it was hot outside so my husband decided to grill some steaks. I got some artichokes steaming on the stove and some red potatoes boiling and pretty soon we had a fantastic “linner”. You know what that is right? The lunch that is so big it takes care of dinner as well. This Sunday there were no appointments or plans so we took some nice long naps. The great part of living in this little town is that pretty much without fail the evening brings a cool breeze. That makes for some backyard time in the evenings when we’re home. I made a pot of coffee, and went and sat out on the swing to enjoy the breeze. The palm trees were swaying, Greta, our German Shepherd is now a middle-aged lady at 6 years old, she bounces around for awhile when she first sees you but she prefers to just sit on your feet and enjoy the evening with you. Lulu, the wonder dog, is only four so she is still quite the spas. She never stops coming to you to play keep away. 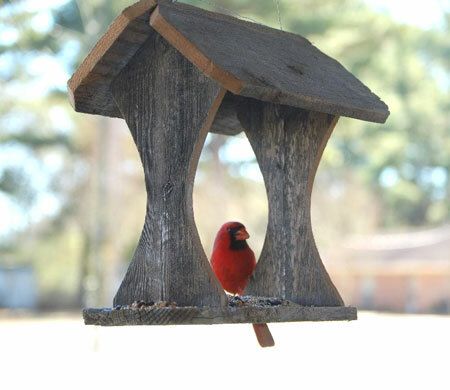 My husband has this bird feeder on the fence, he likes to help God out. The birds came to the feeder as I drank my coffee. Sometimes there were three at a time, sometimes only one. Pigeons and sparrows mostly. They come and stay a few minutes to eat their seed, then stop at the waterfall and take a quick shower. Then they stop at the top of the fence and sing as they figure out where they are going next. They don’t store up seed as squirrels do, there are no to-go plates as funky family members make. They simply eat their fill in that moment. They don’t worry about where the next meal will come from, that is simply God’s job. As I sat there in this simple moment of life, I realize I take life way too seriously. I spend too much time on the what-ifs, making to-do lists and thinking these moments of stillness could be better used to scrub the tub. I think I need to take some lessons from the birds. I’ve been told they’re not very smart, in fact, calling someone a bird brain is an insult. Actually, I think they may be wiser than we are.